The first is our podcast, Animation Is Hard. Having spent so many years building this production into a well-oiled machine, we wanted to share our experiences with the animation community, to support other independent animators and studios who may be working on projects like ours. In each episode, hosts Mike and Matthew discuss the challenges of low-budget animation production, from recruiting freelancers to managing files to crowdfunding. Future episodes will feature interviews with other independent animators and directors, to hear about their own challenges and successes. It’s been about six weeks since “The Ottoman – animated short film” successfully raised $76,700 during its 30-day campaign on Kickstarter. This was Luckbat Studio’s first-ever attempt at fundraising, and although we succeeded in reaching our goal, we also learned some surprising lessons along the way. The Ottoman is a somewhat atypical production compared with most of the other projects listed in Kickstarter’s Film category. For one thing, despite not being a commercial studio, we have a much larger team than most no-budget independents. We’re also not adapting or remaking an existing property, which means our film has no pre-existing fan base. Thus, the reasoning we’re outlining below may or may not apply to other aspiring crowdfunders out there. It’s not about how much your project needs. It’s about how much people think it’s worth. Phrased another way: make sure you do your homework. Kickstarter’s all-or-nothing fundraising model is designed to keep campaign creators honest. If a project’s backers get the impression that its ambitions are wildly out of sync with its goals, they’ll steer clear. But as critical as it is to make a sober assessment of what a realistic budget for your project looks like, there’s another, even-more-important assessment that a creator needs to make, and it’s a lot more sobering: how much money everyone thinks you and your project deserve. There’s no getting around this. You can have all the passion in the world for your project, but if the average joe feels your graphic novel, or album, or game, is entitled to “ten grand at most,” then there’s a good chance that amount is where your campaign is going to plateau. No, it’s not fair. And it seems counterintuitive, since there are a near-infinite number of potential backers out there. But crowdfunding lives or dies on the consensus of crowds. Before you launch your campaign, make sure you ask a bunch of people (not just your friends and relatives) how much they think your project deserves. And if that number is way off from your planned budget, you might want to step back and re-think your strategy. Your goals are not Kickstarter’s goals. Since Kickstarter’s business model is based on taking a cut of all successful campaigns, it’s tempting for a campaign creator to assume that the company is behind you every step of the way, working tirelessly to maximize your chances of success. And it is. To an extent. Remember, when a campaign fails, Kickstarter gets nothing. There are a limited number of slots on the website, and a limited number of hours in a day, and Kickstarter is going to devote its time and energy to supporting those campaigns that are headed for the biggest payoff. If your campaign is still firing on all cylinders, that might be you. But if your fundraising has hit a wall in its second week, and you find yourself praying for a jolt from Kickstarter’s publicity engine, the thing is, there are a lot of competing campaigns that just hit 300% of their goal. And those ones are guaranteed to make Kickstarter happy. The perception of success might be more valuable than actual success. Hopefully by now, everyone in the Kickstarter community is aware that, if a campaign fails to reach its goal, it gets no money and the backers aren’t charged anything. Financially, it’s extremely low-risk. But that doesn’t matter. Backers will always behave as though their pledge is a suitcase full of cash. Time and time again it’s been shown that campaigns experience a big spike in pledges after their goal has been reached. Even though their money is never at risk, it’s as though the backers are still trying to avoid the risk of disappointment. So how does this insight help a campaign’s chances of success? Consider the “Ottoman” campaign, which squeaked past its $75,000 goal at the last second, thanks to a generous matching-funds offer from Maxon Computer. We took almost four weeks just to break past the 50% mark, which for most campaigns would be fatal. We received minimal media coverage, no promotional help from Kickstarter, and never went viral, judging from our total backer count, which was less than 300. Our goal was set at $75,000 because that’s what we calculated we needed to pay the animation team a fair wage. However, consider an alternate scenario: imagine if we’d set our goal at $33,000. We potentially would’ve hit that amount during week three, at which point those backers who’d been on the fence start reaching for their wallets. The Kickstarter algorithm, noting that the campaign has passed 100%, lists the project up on the “Popular Campaigns” page. At that stage, with the project guaranteed to get made, press coverage becomes a lot easier to attract, and the hype begins to kick in. Or maybe none of those things happen, we stall at $45,000, the campaign “succeeds” despite having raised little more than half of what we calculated we needed, and the project momentum is crippled. It’s a hell of a gamble. Kickstarter is a machine that converts hype into money. It sounds like we’re advocating deliberately low-balling your own needs to create an exaggerated impression of your success. But that’s not what we’re getting at. We’re saying that backers are extremely risk-averse, and are only willing to collectively pledge up to the amount that your project feels like it’s worth. Whatever that amount is, you need to figure it out, because that’s the number you should be setting your goal at. If you really need double that number to reach your budgetary goals, you’ll have to make up the rest with shameless self-promotion. The campaign is on! Congratulations to everyone on the team! Branden Coker joined the team recently to help develop our animation models into physical figurines. It’s a very labor-intensive process, but the photos below speak for themselves. We asked Branden to go into detail about his process and his art. I think 3D printing is a common interest among digital artists today. Creating a tangible object from your digital art to have in your hand or on your desk is very appealing. I’m a 3D modeler by profession, and I loved building scale models when I was younger. Those two interests naturally complement each other well. When I set out to create the Scarab print, we were starting with a production model that was created with animation in mind. 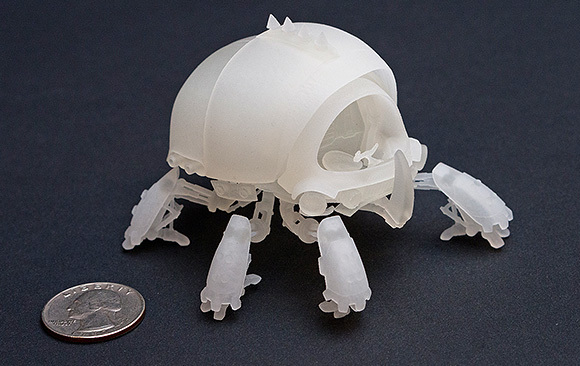 This is about as far as you can get from a model that’s suitable for 3D printing. 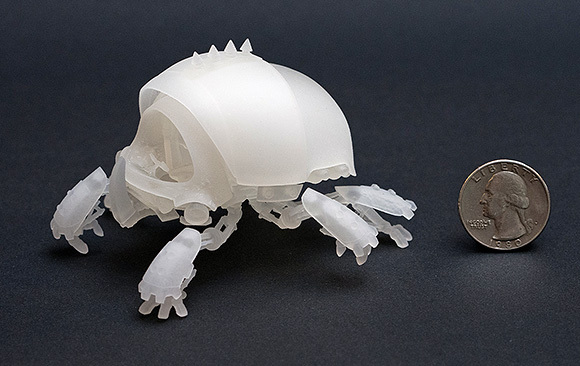 The Scarab in its original form was over 900 discrete meshes (or shells). In order to print properly, all of them had to be combined into a single water-tight mesh. The next things to consider were thin walls and other details that the printer wouldn’t be able to reproduce. Those had to be either thickened and enlarged, or eliminated entirely. Finally, to facilitate painting of the final printed model, we decided to break up the mesh into 18 interlocking elements to be assembled after printing. This last step was by far the most challenging part of the project. Assembling all of those parts after the first test print and seeing that they all fit was a great relief! ZBrush is probably the most often used tool in my toolbox for this kind of work. Without Dynamesh, I probably wouldn’t even attempt a job like this. Another great tool is MeshFusion for Modo. I had some difficult, precise cuts to do on the head of the Scarab that were a little too delicate for Dynamesh. MeshFusion made quick work of it, and the results were better than I could have hoped. I think a lot of people who are only moderately familiar with 3D printing may perceive it as having a very narrow purpose. For most people, 3D printing is what you use to create desk trinkets. In reality, we’re only beginning to see the potential of additive manufacturing. From printing food safe materials, to foods themselves the possibilities are just expansive. 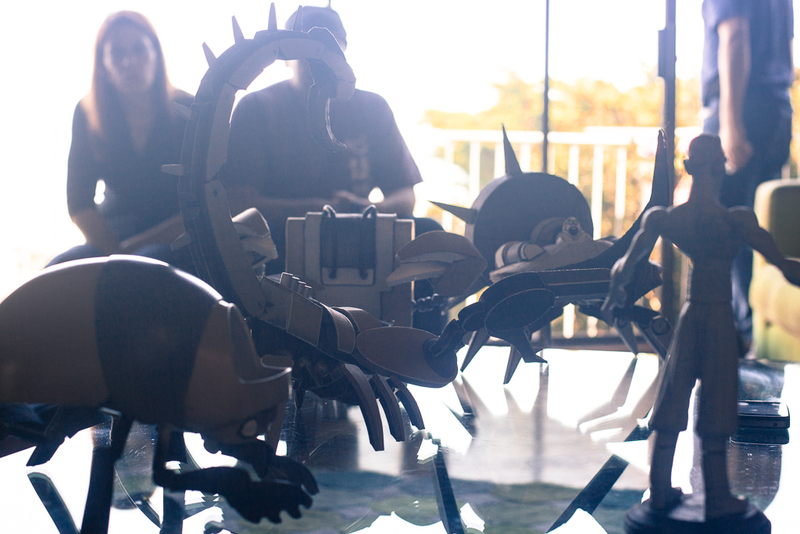 Take a look at what e-NABLE is doing with affordable prosthetic hands for kids. Read some of the stories about how doctors are leveraging 3D printing to accurately scan and recreate difficult procedures before picking up the scalpel. It’s still in its infancy and it’s already improving lives every day. Inspiring stuff! Much like any other art form, it’s only as good as the time you’re willing to put into it. Do your research and get familiar with the process you’ll be using to print. These printers all have unique challenges and advantages. If you design for your intended print process, you’ll fare much better than just hoping for the best. 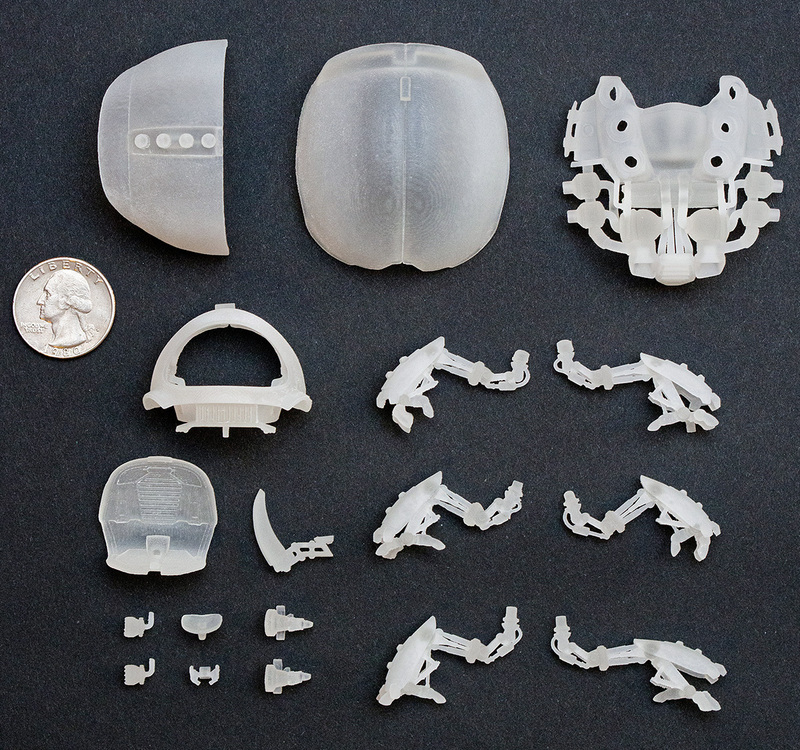 Shapeways has detailed material and process information for each of their products. Bookmark those pages and read them through before sending that final model to print! We’ve been using the recently completed shot 18 as one of our first compositing tests, and figured we’d share the work in progress. It’s only basic lighting so far, but the ability to adjust contrast and saturation in layers allows us to really bring out the comic-book look we’re going for. For a while now, the Ottoman team has been using Google Hangouts for our weekly videoconferences. The narrow banner across the top of the Hangout page always looked a bit bare, so we filled it in with images of whatever we were slated to discuss that week. Over time, these little strips have become a kind of kaleidoscope of progress, showing colorful glimpses of the project as it develops. Here are some of our favorites. Scarab mecha: heavy armor textures. Seq. 3, shot 1.1 – The Scarab enters the ruins. Seq. 3, shot 4 – The Ottoman reaches for a flare. The medina, from on high. Seq. 3, shot 13 – The scorpions close in. Seq. 3, shot 17 – The Ottoman races back to his mecha. The medina: radio station textures. Seq. 3, shot 29 – The Ottoman’s wife awakes to strange noises. Now that our mecha is rigged, it’s time to test it out. But how does a six-legged vehicle get around, anyway? 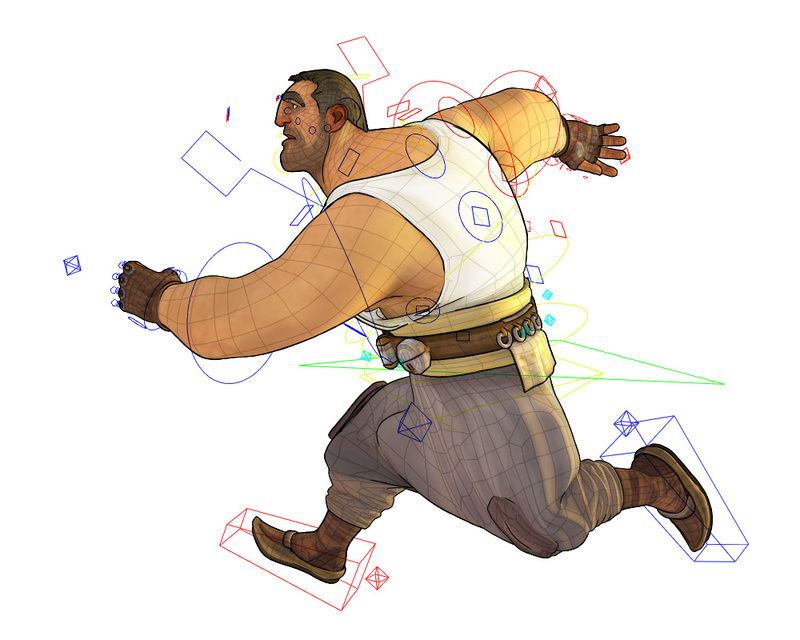 Animator Mark Medrano assembled this collection of walk-cycle tests, to help answer that question. This is a very common gait in both insects and robotics as it is statically stable, meaning that the machine can stop at any point during the step cycle and not fall over. As long as its center of mass remains within the triangle formed by the feet on the ground, the machine can maintain some margin of static stability, even at fast speeds. A cockroach can travel nearly ten times its own body length per second before its gait becomes unstable. This is also a statically stable gait, even more so than the tripodal one, since only one foot at a time is ever off the ground. This gait also occurs in nature but tends to shift from one side of the body to the other, sometimes lifting legs at random rather than the specific pattern displayed in the render. However, the increase in stability of this gait comes at a great cost of speed. Since the forward leg must travel much faster than the legs pushing back, actuator limits will kick in long before the machine can get up to its top speed. This gait can be seen on insects whose legs have been hurt. Despite it being an unnatural walk, their nervous system automatically adapts. For our purposes, the legs don’t have to be damaged for this gait to be useful. If mecha-scarab needs to carry a heavy object, we can fall back on the same leg sequencing that a quadruped uses. This gait is referred to as dynamically stable: the two feet left on the ground don’t provide a solid base, so the machine needs to constantly adjust to keep from tipping over while it’s walking. We’re comfortably certain that no real-world insect walks this way. Pretty adorable, though! Bret Bays, the Ottoman project’s Character Technical Director, has been rigging up a storm lately. As animation ramps up, his character controls are constantly being put through their paces. Despite an endless torrent of extreme poses and feature requests, Bret’s meticulous devotion to his work shines through. We thought it would be good to share a profile of the man and his work. I came to Ottoman project when I met [Animation Director] Dimos back in summer of 2009. I was attending Animation Mentor at the time, and he was a mentor there as well. We had sort of met through C4D beta testing, but when he found out I was at AM we began to talk. When I first started, reusing rigs was the biggest challenge. There was no system in place. Python wasn’t implemented yet (in R11) and I didn’t know COFFEE, so scripting it was not an option for me. R13 helped solve that issue, but it had its own quirks when trying to easily and quickly rebuild rigs. They have a lot of fundamentals. They’re sturdy. 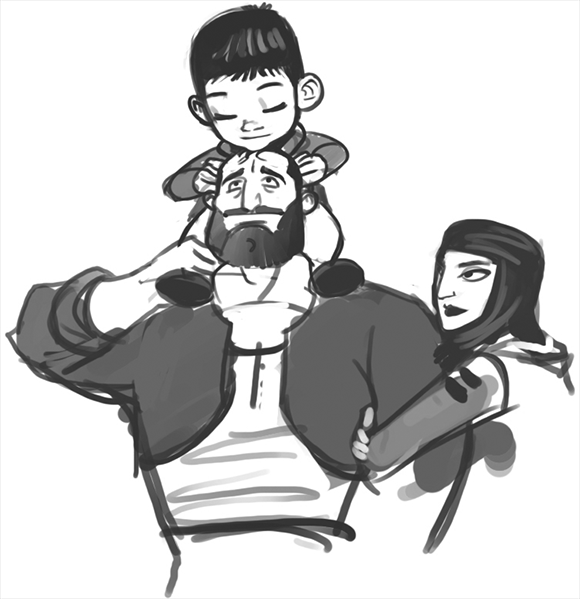 There’s always stuff I’d like to add, or do differently, as time goes on, but if I kept going back and revising, the short would never get animated. I’m glad I got it working as a template though. Might be safe to say I’m the first person to create a face rig template in Cinema 4D. I was pretty proud of the Scorpion Mecha rig. That was a challenge, and I like the dynamic, springy-ness of the cockpit. Even if the setup for it is not anything particularly special, it was something I had never done before. I haven’t really ever been a part of a team that finished something, and I haven’t had much opportunity to show off my work. All of the short ideas I have had, I haven’t been able to materialize much. I felt like there was so much potential with this short, and we’re getting so far, that someday I’ll be able to point at it and say, “Hey, I helped make that happen.” This project has led to new job opportunities, so I just want to keep at it and see it through. Just keep practicing. Rig as much as you can and learn to script so you can automate things. Your life will be significantly easier if you can automate some of the more tedious and boring tasks. One of the main discussion topics at our Ottocon get-together was the slow pace that comes with collaborating over the internet. We’re all working other freelance or full-time jobs, and it’s tough for the team members to get prompt feedback, or to keep tabs on how the work is going. The team already relies on tools like Facebook, Basecamp, Google Plus and SVN to exchange files and information, but the sheer volume of information traffic makes it hard to filter and prioritize. 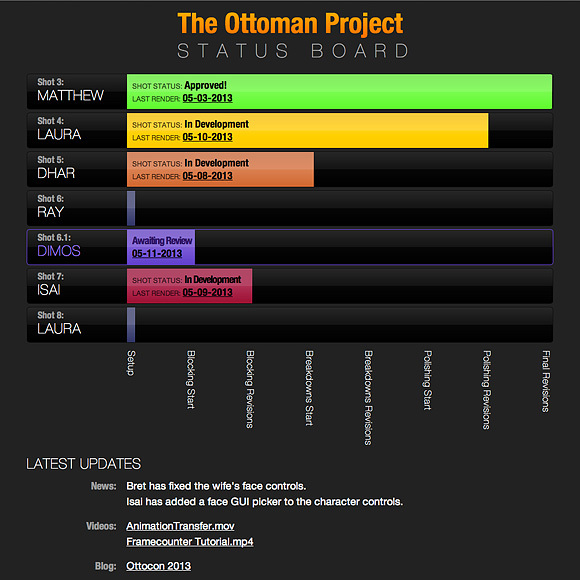 So, to deal with the signal-to-noise issues, we created the Ottoman Status Board. Heavily inspired by Panic’s Status Board, this colorful progress readout allows the animators to get a snapshot of the project’s status at a glance. It also allows Dimos, our animation director, to see who’s waiting for feedback, and where their latest files are. It’s been a rousing success so far—only a few days in, and we’re already seeing a quicker turnaround on feedback and revisions. Over the coming weeks, we’ll be looking to add new info-readout components based on animator requests. The Ottoman animation team at brunch. 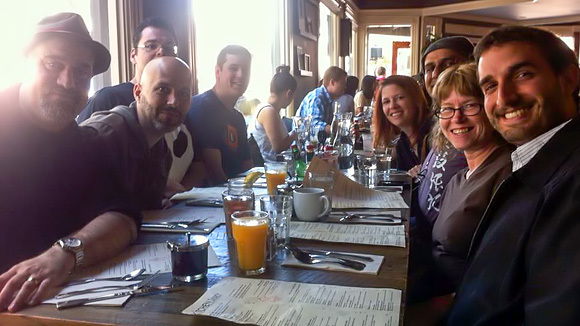 Last weekend, the entire Ottoman animation team converged in San Francisco for our first-ever in-person get-together. Many of us know each other only through videochat, and it was a blast to finally shake hands and geek out about spline controls and run cycles. Special thanks to everyone who traveled by plane, train and automobile to be there. We’ll have to do it again next year! A collection of hand-crafted maquettes of the mecha and characters. There were toys. There was cake. Everyone loves surprise mecha cake.